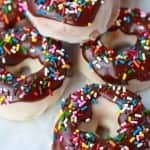 Baked Donuts – Baked vanilla donuts dipped in a vanilla glaze and then drenched in a chocolate glaze and topped with sprinkles. I realized that I have been neglecting my donut pan. It’s been way too long since I baked donuts! Since there is a never-ending list of donut recipes that I want to try, I decided to get to work. This recipe seemed like the perfect way to end my donut-baking dry spell. Two glazes? Yes. I figure if you’re saving calories by baking your donuts then it’s more than OK to have two glazes. Trust me, once you taste these you will agree. These donuts are a definite crowd pleaser. There’s no need to choose between chocolate and vanilla – you get them both! Throw on some colored sprinkles and you have a fun and delicious breakfast. Enjoy! 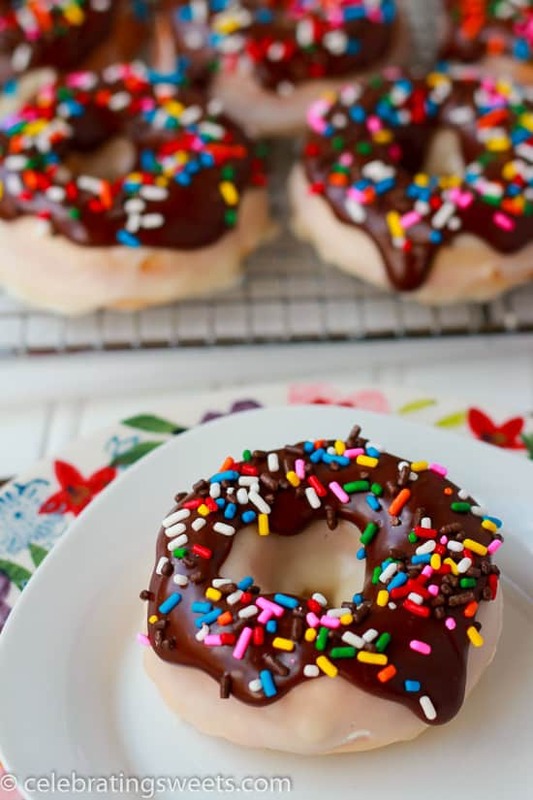 Baked vanilla donuts dipped in a vanilla glaze and then drenched in a chocolate glaze and topped with sprinkles. Preheat oven to 350°F. Butter or spray two 6-count donut pans and set aside. Set a wire rack over a baking sheet that has been lined with foil or parchment paper (this will make for easy clean up later), set aside. In a medium bowl, sprinkle the yeast over the warm water and set aside for several minutes. In a large bowl, whisk the flour, sugar, baking powder and salt until combined. Set aside. Add the eggs, yogurt, melted butter and vanilla extract to the yeast mixture and whisk until combined. Add to the flour mixture and stir until thoroughly combined. Spoon the batter into the donut pans filling each a little more than half full. Bake until they spring back when touched and they are golden brown, about 12-14 minutes. Allow the donuts to cool in the pan for 5 minutes, then remove from the pan and set the donuts on the prepared wire rack to continue cooling. Cool completely before frosting. Combine all ingredients (beginning with only 2 tablespoons of milk) in a large bowl. Whisk until smooth. Add another tablespoon or so of milk, if needed, to thin it out. Place a donut in the vanilla glaze and flip it around several times to coat it completely. Return to the wire rack and allow the glaze to harden, about 15-20 minutes before topping with the chocolate glaze. 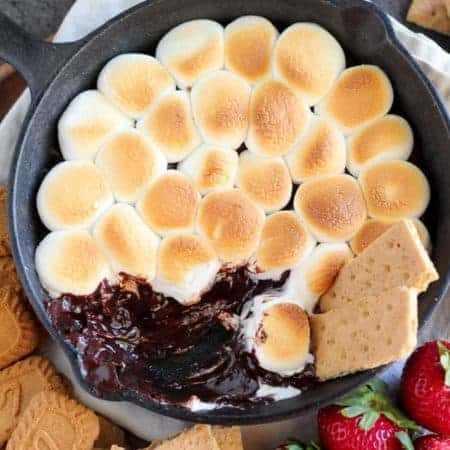 In a small saucepan over medium-low heat, melt the chocolate and butter. Once melted, remove from the heat and add the powdered sugar, vanilla and milk. Whisk until completely smooth. If you’d like the glaze to be thicker, add a little more powdered sugar. 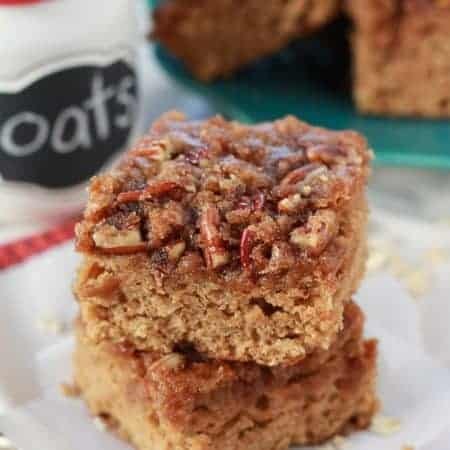 If you’d like it thinner, add a little bit more milk. Use a spoon to pour some of the chocolate glaze over the top of each donut, allowing it to drip down the sides. Immediately top with sprinkles (if using). Allow the glaze to firm up on the donuts before serving. Those are seriously such gorgeous donuts! I would eat more than I should since they are baked! Wow, these vanilla donuts look GORGEOUS and so fluffy on the inside! I love that you used both chocolate and vanilla glaze, so unique! Ermm… two glazes & sprinkles. YES PLEASE!! 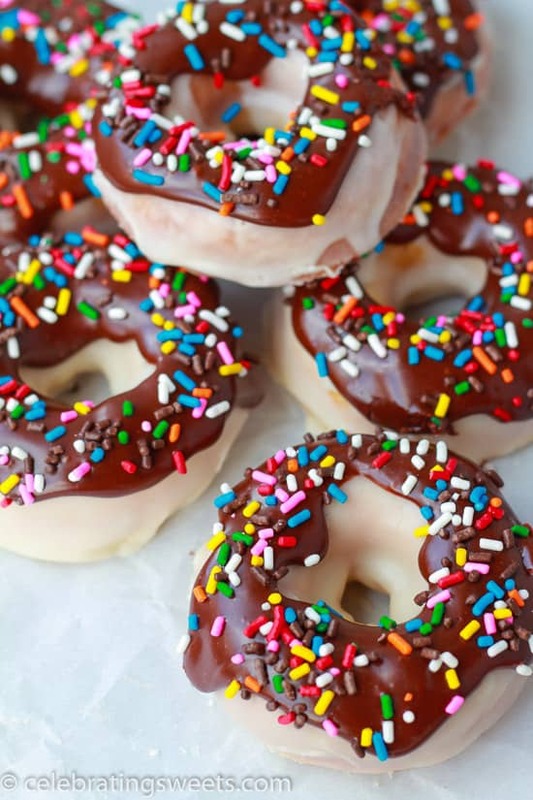 Gorgeous donuts! Wish I had one or two right now! Thanks for linking up with What’s Cookin’ Wednesday! Hi Allison! I have a serious donut problem and these are just feeding the addiction! YUM! Oh my gosh, two glazes! I wish I could reach through the screen and grab one of these, they looks amazing! These have been featured as one of my favourites over at Sweet and Savoury Sunday. Stop by, grab a button and link up again with us. Have a great weekend! 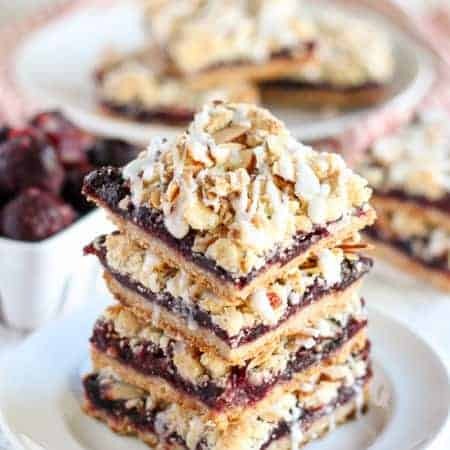 Just came across this recipe on Pinterest! 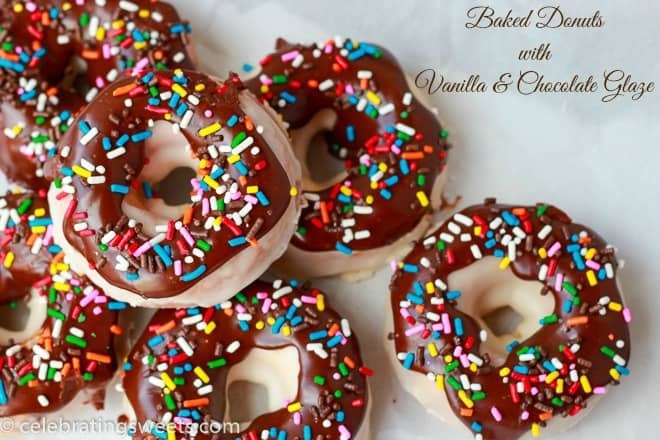 I am thrilled to find a “yeast” donut recipe that I can try in my electric donut maker!! Thank you! I made these with only one glaze. They came out good.